The field of e-discovery is constantly changing, and there are many new and old ways to get into trouble as a litigator. 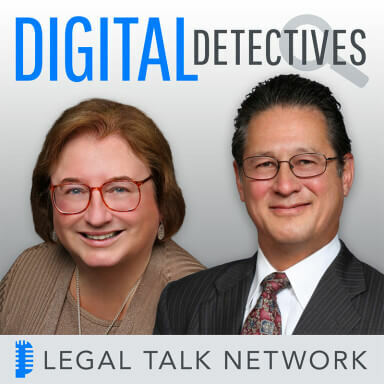 In this episode of Digital Detectives, Sharon Nelson and John Simek discuss some of the most common reasons lawyers run into e-discovery ethics issues, including social media, Yelp reviews, document manipulation, and “hiding the ball” by giving opposing counsel too much data. And negligence is no excuse; if you’re not qualified for the discovery needs of the case, Sharon and John explain, you must get the education, hire a competent lawyer, or decline representation. They also go over a bunch of high-profile examples and talk about the General Data Protection Regulation (GDPR), which goes into effect on May 25th, 2018. Sharon D. Nelson: Hey listeners. There is a brand-new show on Legal Talk Network about the First Amendment, called Make No Law. Trust me, it is phenomenal. Here’s a quick trailer about the show. Ken White: News and pop culture are full of controversies about free speech in the First Amendment. We hear terms like hate speech and heckler’s veto in a barrage of coverage about campuses, protests and even wedding cakes, but what does it all mean and how do we get here? That’s exactly what my new show Make No Law: The First Amendment Podcast from HYPERLINK “http://www.Popehat.com” Popehat.com will explore. Sharon D. Nelson: You can find Make No Law on HYPERLINK “http://www.legaltalknetwork.com/”legaltalknetwork.com, Apple Podcasts, Google Play, or wherever you are listening to this podcast. Enjoy. Sharon D. Nelson: Welcome to the 89th edition of Digital Detectives. We are glad to have you with us. I am Sharon Nelson, President of Sensei Enterprises, a digital forensics cybersecurity and information technology firm in Fairfax, Virginia. We’d also like to thank our sponsor HYPERLINK “http://www.PInow.com/”PInow.com. If you need a private investigator you can trust, visit HYPERLINK “http://www.pinow.com/”pinow.com to learn more. John W. Simek: Well, today, Sharon and I are talking about ethical misadventures in e-discovery, a topic that we discussed in a brand-new presentation that we gave just last Friday for the Virginia Trial Lawyers Association. So, let’s get it started, Sharon. Sharon D. Nelson: All right. I will take it away here. As we told our audience last Friday it’s all too easy to step off a precipice without realizing that you were ever on the precipice. It really is very simple to do and we’re going to talk about some stories that make that clear to you that it’s something to be alert about at all times. The terrain around you shifts constantly in e-discovery and you don’t want to find yourself falling into a sand trap. So, one of the things that we talked about was California which became in 2015 the very first State to require competence in e-discovery, and basically what that opinion said and believe me, you do want to listen to this even if you’re not in California, it said if you’re not competent to handle an e-discovery matter, you have to acquire the skills needed, you have to find a skilled lawyer or get expert assistance or you have to decline the representation. Now, that’s pretty blunt. The thing that is really striking about this is that I know in my own State of Virginia our Bar Council has said, hey, we may not have an explicit ethics rule, but it’s implicit in Rule 1.1 competence. So, basically, that’s what Bar Council in Virginia lectures you must do whether or not there is an ethics opinion. So, I think that goes probably for a lot of other states as well. John W. Simek: So, we also talked a little bit about some of the common areas where lawyers get in trouble as they’re dealing with their digital evidence and there’s some obvious ones, social media, those types of things, posting things about cases on Facebook or tweeting about things or stuff like that. Certainly confidential information they shouldn’t be doing that. Another area is Yelp reviews. So, if somebody puts a bad review out there and maybe a prior client of yours and says, geez, this attorney really didn’t do a good job for me at all, I didn’t get the expected results and it cost me a heck of a lot of money, you certainly don’t want to answer that yelp review with something along the lines of, well, if you weren’t beating your wife all the time you wouldn’t have gotten what you got, so that’s true, yeah. Sharon D. Nelson: And that’s a real case. John W. Simek: So, that’s one area. Deceit and criminal activity, borrowing from trust accounts, that’s another area that attorneys get in trouble with, hiding the ball as part of e-discovery, just throwing massive data dumps at people. The judges don’t like that when you’re not playing fair if you will. Attorney misconduct in court and that happens on both sides, from the prosecution as well as from the defense side. Sharon had already talked about the incompetence with the technology, but if you don’t know it yourself you need to get some help about what the technology issue is. And then we’ve also seen cases too where you’ve had manipulation of documents and backdating of documents and things like that, in order to cover your tracks, because maybe you missed a deadline or something. So, you generated this letter that said to your client saying that because they are in ill health the Statute of Limitations and we’re not going any further with this thing and then they’ve misdated those documents. So, those are just some areas at least in real-world areas of where lawyers have gotten into trouble when they’re dealing with electronic evidence. Sharon D. Nelson: Well, as you referred to John the judges have lost patience with e-discovery ignorance and we have seen people say, there’s one great one here where an attorney said I have to confess to this court I am not computer-literate, I have not found presence in the cybernetic revolution, I need a secretary to help me turn on the computer, this was out of my daily life. John W. Simek: It sounds like some of our clients, doesn’t it? Sharon D. Nelson: Yeah, you got to get a new line, right? But the judge in that case basically said professed technological incompetence is not an excuse for discovery misconduct and sanctions were awarded. But we’ve also heard judges say things like why are you standing in front of me if you don’t know the basics of e-discovery? What do you mean? You did an email meet and confer? And then we’ve heard, this actually came from a retired Judge — Magistrate Judge David Waxse. He used to say that if you think the other side is unreasonable, have your next meeting videotape for me so that I can see, and he said he never got a videotape, so that was pretty effective. He also said notoriously and I love this line that lawyers are like particles in physics, they change when observed. That’s a good line. And Judge Vanaskie from Pennsylvania talked about the fact that he actually told people if the other side was supposedly very unreasonable that he would get on the phone while they were having their phone meeting or actual meeting and he never had that phone call either, so if you are active, apparently there’s some things you can do. Notably in February of this year there was a Federal Judge survey report that was issued in which it was said that only 23% of judges thought that typical attorneys who weren’t specialists in e-discovery but typical attorneys only 23% of them had the legal and technical competence that they needed, 63% thought that their judicial peers were competent, which I thought was high and I thought it was high in the sense that it’s probably accurate because we have seen the judges getting more and more sophisticated. Magistrate Judge Facciola, who is now retired, wrote in the report, it is distressing to start a new year with old bad news that lawyers still do not get it and the chasm between the few who get it and the many who do not, is still the size of the Grand Canyon. It was also noted in that report that the lack of cooperation is the major reason that lawyers get themselves in trouble. John W. Simek: Another challenge that the attorneys have especially when we are talking about the electronic evidence in the digital era is the massive amounts of information that we have to deal with now. So, this whole concept of big data, there is in a single case I think that you’re going to run across where there is in some form of electronic evidence at issue, even though you may not think that there is. Email in particular is probably pretty prevalent in pretty much all cases. It may not be appropriate, that the evidence may not be appropriate in the email but you certainly need to consider it. But attorneys got to deal with this massive amounts of information, so be careful what you ask for, don’t ask for that — what is that phrase, Sharon, “any and all”, right? Sharon D. Nelson: Yeah, you are going to get it dump. John W. Simek: So, you need to make sure your requests are narrow and very specific and you come to some agreement with the other side, those types of things, but another term that attorneys may or may not be aware of is dark data, and this is data that you hold that you don’t know that you have it, and it could be squirreled away on a USB Drive or something, you maybe got it from your client and somebody’s stuck it in a drawer somewhere, and they haven’t had a chance to review it, but you have all this data that you don’t know that you would actually possess. Data in the cloud, more-and-more people now are using cloud services and when we’re using cloud services, do you remember all of the information that you put up there in the cloud, because more-and-more — Office 365 is an example, I mean, more-and-more attorneys now and more-and-more of our clients are moving to Office 365 and OneDrive and SharePoint Online, and all those kinds of things. Well, you don’t have your hands around that, it’s not sitting on a server in your computer room, it’s up in a cloud. Microsoft has that or whoever Salesforce or whoever — whatever cloud system you’re using. So, we need to address all of that stuff as well and the amount of data and the types of data that are in the cloud vary by vendor so you have to be knowledgeable about all that. We talked about social media earlier, certainly social media I think is here to stay. Unfortunately, I think it’s here to stay. Sharon D. Nelson: Although currently sliding down a bit, at least Facebook. John W. Simek: Well, Facebook is, yeah, but which amazes me that the recent news about Facebook everybody is jumping ship on Facebook and they are jumping to Instagram. Sharon D. Nelson: Which Facebook ups. John W. Simek: Right, apparently those Instagram users now they never realized that. So, it’s if you are trying to send a message to Facebook, you really didn’t do a good job with it, so you have all that information and there’s more-and-more of those things coming up all the time, right? I mean, it used to be what two years ago, a year or two years ago Kik Messenger was the text messaging app of choice; today it’s WhatsApp. The landscape shifts so much, unfortunate part is as an attorney when you get into legal action you are usually behind the curve already. So, the legal action that you’re involved with today probably has something actually occurred two years ago, three years ago. So, you need to understand what that technology was in place back then not what’s in place today. So, having said that before we move on to our next segment let’s take a quick commercial break. John W. Simek: At least 80 of the 100 biggest law firms in the country had been hacked since 2011. Protect your firm and your clients from cyber attacks with SiteLock. Their industry leading cloud-based suite of website security solutions includes website scanning, web application firewall, including DDoS mitigation, and 24×7, 365 US-based customer support. Give your firm and your clients’ peace of mind knowing their information is secure. Learn more at HYPERLINK “http://www.sitelock.com/legal/digitaldetectives”sitelock.com/legal/digitaldetectives. Sharon D. Nelson: Welcome back to Digital Detectives on the Legal Talk Network. You may recall, John, that several years ago we were at a CLE and we saw Judge Ellis from the Eastern District of Virginia and he said, I may not have gotten the “word for word” but it’s darn and close he said, “If I find that you are hiding the ball, you better hope that you never end up in my court again because I promise you I will remember your name”. Now, he was pretty clear about what he meant there and let’s talk about people who do hide the ball and to deliver its spoliation we sometimes see and occasionally we see attorneys involved in the spoliation. It can be tempting I understand that, and one of the photos we use is we have a photo of a little mouse and he’s looking at a mousetrap that has a nice big piece of cheese in it and he’s got a little football helmet on his head. So, I use that to analogize to lawyers that they think that they’re going to get away with it because they have some kind of little football helmet and it might be just a little bit of technology or they think they are smarter than the next guy, they are just smart enough to be dangerous to themselves is usually what happens, because although it’s easy to delete stuff how do you hide the fact that you hid, that is much harder, and we are often hired to find the evidence of spoliation. So, there is a lot of things people don’t understand. They don’t understand where all the data resides, where you might have to delete it in multiple places, they can’t hide the evidence of the deletion, people may have saved damning texts and emails, yada, yada, there is a lot of stuff that goes on. And one of the most famous stories about spoliation involving an attorney actually comes out of Virginia. An attorney by the name of Matthew Murray; we talked about this last week and I felt a little bad because Matthew Murray was the past President of the VTLA to who we were speaking, but he stepped off that precipice. He had a case involving a concrete truck which rolled on to his client’s car killing the client’s wife, and along the way his client apparently had some stuff on Facebook and he actually told his paralegal to tell the plaintiff to clean up his Facebook page. So, he had things like himself in a t-shirt that said “I heart hot moms” things like that. The photos were in fact deleted but later recovered, but that email that he sent to the paralegal that the lawyer said he called it the stink bomb email which is certainly was. He told the paralegal not to produce it. She didn’t, he blamed the paralegal, then later kind of recanted on that. Ultimately, he got a five-year suspension from the Bar. He had to pay a $542,000 fine and he ended up leaving the practice of law, which is of course very sad. But he was found guilty of failing his duty of candor, fairness to opposing parties and counsel and engaging in dishonesty fraud deceit or misrepresentation. Now, that’s a lot for an attorney to get that messed up to make those kind of decisions. So, that’s a good case for attorneys I think to know and read and take to heart just in the sense that you have always got to do what your ethics code and your professionalism rules what they require of you. John W. Simek: Further on that we told a couple other stories too about the mishaps of what attorneys have done and one in particular was DOJ attorney. It was a case that they were filing an investigation against a former Deutsche Bank trader and they had put this evidence or data, if you will, into a motion and they redacted portions of it, but the way they were redacted it was all wrong. It effectively was used in a black marker, if you will, a black highlighter, but the font was in gray, was a gray font so it was very easy to even see what the words were there, kind of like in hidden figures, right, Sharon, when she holds up the reacted stuff to the light to see what the numbers are, similar kind of thing. So, the message there is that if you need to redact information, you redact it properly, have that technical competence that we have been talking about. If you are using PDF, learn how to redact a PDF properly, don’t just put a highlighter on it because many, many times all you have to do is just do a copy and paste of that information and it will dump those words into another document as an example. But in this particular case since they did this improper redaction, it pretty much almost blew their case open because they revealed the nature of testimony of the testimony that this traitor had and that was compelled testimony in the UK, and when you do that you stand the risk of — and this was a cross-border case which they didn’t understand. You stand the risk of that evidence being thrown out because you disclosed it and revealed it. So, that was a really big boo-boo for them. Another case that we talked about involved law firm leaking Pepsi’s secrets of an internal investigation to Wall Street reporter. Now, we believe or we think that this is as a result of autocomplete, when you are filling out an email address and the address fills in automatically and whoever they are trying to send this information to it ended up going off to a Wall Street reporter, and then that happens more often than not, this autocomplete gets a lot of people in trouble. But, it had to deal with the — Pepsi had an internal investigation into an acquisition of a Russian drink company that they had acquired and the general counsel had departed at that same time, the SEC was investigating this as a result, so the SEC was involved in all this, but essentially it was the history of Pepsi’s whistleblower activity is what was revealed off to the Wall Street reporter, and it certainly wasn’t the intention of the law firm to do that. Sharon D. Nelson: Nobody good. John W. Simek: But a lawyer in the Wells Fargo Data Breach case, what had happened there is that they were involved in its legal action and the attorney was reviewing the electronic evidence in order to produce it to the other party and what they — what she ended up doing was giving off the private information, the name, social security numbers, investment portfolios, the fees that were charged, whatever for a boatload of the Wells Fargo clients, about 50,000 of them, if my memory is right, that she sent over there. But, at the end of the day she didn’t understand how to use the review platform that they had. So, think of it this way, when you are reviewing the evidence, you get like an Excel spreadsheet and the stuff was coming up and only so many rows were showing and apparently she didn’t notice the little button down in the lower right-hand corner that said, more, to look at all the rest of the data. So, it was a very small subset of it, and then she blamed it on the vendor error — vendor processing error, but no, it was really attorney’s error. They didn’t know how to use the tool properly when they are reviewing it. And what I thought was kind of comical about this is once the other side got this information and they went, whoa, man, this is kind of confidential information, we shouldn’t have gotten all this stuff and so they notified this — the lawyer and she immediately fires off this email that says that they have to return the CD ASAP. Even though the amount of data that was shipped over there was 1.4 gigabytes, which is about twice as much as what a CD can hold. So, she didn’t understand even the terminology to use. It had to have been a DVD if it was an optical disc. So, it’s – again, we can’t make this stuff up, but that’s another place where you need to understand, you need to learn the tools that you are going to use, right? If you’re dealing with electronic evidence, and as I said earlier, there’s a boatload of this stuff that you need to review and go through. Now, the good news is, and you know, Sharon, is that Artificial Intelligence is starting to come into the e-discovery world now. So, a lot of the Machine Learning things are happening that are going to help lawyers; so, hopefully, we’ll minimize the kind of mistakes that this one did. Sharon D. Nelson: Well, let’s talk about what I considered to be one of the most comical things that happened recently, and that was last year, when Jared Kushner’s attorney, he has of course many, but Abbe Lowell is a very reputable and respected lawyer here in the DC area. But, he was fooled by a United Kingdom prankster who pretended to be Jared Kushner and he wrote asking Lowell about some adult material on one of his private email accounts. Now, Lowell, being a very reputable man, advised the phony Kushner to preserve the evidence, which of course was sound advice. Then, Lowell got an email from the Senate Intelligence Committee and they were angry that Kushner had not disclosed a private email account. Now, this is where Lowell, I’m sure he’s learned a lesson now, he took that email from the Senate Intelligence Committee and he sent it to the fake Kushner, the impostor, and what do pranksters do, well, that’s what this guy did, he posted it on Twitter. So, of course, it made the funny papers. John W. Simek: The communication method of choice. Sharon D. Nelson: Oh, my golly, oh, my golly, and you know that Mr. Lowell did a face bomb when that happened, but the message there is, we have to be careful as attorneys to know what the authorized email addresses are for our clients and especially, if they are clients who are powerful, famous, whatever, you really want to make sure that you know who you’re talking to because there are pranksters out there. John W. Simek: Well, another case from Virginia that happened in February of last year, Harleysville Insurance Company v. Holding Funeral Home, Inc. et al, was kind of instructive first off the one party sent the discovery materials to the other side and put it in a Dropbox; well not Dropbox, it is actually boxes what they used. But, I can’t tell you the number of times and you know this as well, is that where people are moving confidential electronic information, electronic evidence via Dropbox or some file sharing system and they’re not encrypting it first. Sharon D. Nelson: And that’s become just dead commonplace, just dead commonplace. John W. Simek: Oh no, well, we probably would at least once a week or every two weeks, we see that happening that lawyers are doing it, no matter what we tell them. Sharon D. Nelson: Yeah, they are not listening, John. John W. Simek: Yeah, maybe we need to use a different language or something, I don’t know. But the Magistrate Judge in that point said that, well, he awarded sanctions and did all sort of stuff and says that you can’t doing that because it’s akin to putting the information on a park bench, leaving it on a park bench, that ruling was overturned later because they were using box. Sharon D. Nelson: It wasn’t quite as open in fairness to the judge. John W. Simek: Right, yeah. Sharon D. Nelson: It wasn’t quite as open as everybody had made it out to be, but is it a smart play? No. John W. Simek: But in the filings though, in the motion that they filed, they actually identified and put in the public record what the darn link was. Sharon D. Nelson: Well, that’s the part that troubles me. John W. Simek: Yeah, so there’s your park bench. Sharon D. Nelson: Once you do that all that’s all, but had the thing been encrypted it would not have been. John W. Simek: Correct, correct. Sharon D. Nelson: You would have had to need credentials. So, all right, we’re doing good here, John, do you think we should move on to our last segment and take a quick commercial break? John W. Simek: That sounds like a great idea. Advertiser: Does your law firm need an investigator for a background check, civil investigation or other type of investigation? HYPERLINK “http://www.PInow.com” PInow.com is a one of a kind resource for locating investigators anywhere in the US and worldwide. The professionals listed on PInow understand the legal constraints of an investigation, are up-to-date on the latest technology, and have extensive experience in many types of investigation, including workers’ compensation and surveillance. Find a prescreened private investigator today. Visit HYPERLINK “http://www.pinow.com/”www.pinow.com. Sharon D. Nelson: Welcome back to Digital Detectives on the Legal Talk Network. Today our topic is “Ethical Misadventures in E-Discovery”. Now, I am the first one to say I am not an expert on the General Data Protection Regulation (GDPR). John W. Simek: It’s not what you had in the slide last week, though. Sharon D. Nelson: I know, thank you for fixing slide chart, and did you have to bring that up? Oh, it’s a good thing we are married, dear. All right, effective on May 25th, so it’s coming up quickly. The GDPR is going to affect a lot of people who are not prepared, I mean, this is a nest of snakes that lawyers are going to walk into and everybody knows that, because for some reason, we just have not gotten up to speed. Most of the law firms have not, only probably the largest law firms have had a tendency to prepare for this, and even they may not be woolly prepared. Now, who does this impact? It impacts any entity that offers services to European Union residents and also to entities which control, process or hold personal data of EU residents. Now, we asked last week at the VTLA, we asked how many people fell under this and there certainly was a good minority of folks, who this would apply to. So, I know that there might be solos and smalls that never deal with any of this but there are going to be a good number of folks, even among the solos and smalls and among the mid-sized firms and certainly the large firms that are going to have to comply with what is a very serious set of regulations, and the fines. The fines for disobeying this thing, not being in compliance are horrendous. So, if you have not looked into it and if you are doing e-discovery that may involved European Union residents, it’s time to come up to speed and quickly. John W. Simek: So, let’s close out a little bit with and talk about TAR or Technology Assisted Review searching and those kinds of things because I think that’s any attorney that’s dealing with electronic evidence in a case needs to know about these things. Early days, predictive coding was the big buzzword, it went around with what it was a CAR (Computer Assisted Review); TAR (Technology Assisted Review) is kind of stuck now, that’s what everybody is pretty much using as a term. We’re at TAR II, right, the second generation of it. Continuous Active Learning is being used a lot within the TAR II environment and I mentioned AI earlier on or Artificial Intelligence now has really come into the e-discovery market. Now, in the early days, this stuff was pretty expensive and you had to have a big case worth a lot of money in order to really use it. But the good news is the pricing has come down quite a bit for any of these tools, a lot of the tools are online now. So, you can just use an online repository and upload your data, use a web browser and access the information, tag it for privilege or redacted or do any of that stuff. But even the courts have accepted it as a method of review. We even had again in Virginia case, Global Aerospace, Inc. v. Landow Aviation, LP, that was back in 2012 where Judge Chamblin had ordered that to be used. But, why don’t you talk, Sharon, a little bit about your experiences with Judge Peck and what his view on TAR was? Sharon D. Nelson: Oh, I don’t know if we want to go back there. I wrote a blog-post a long time ago; a long time ago, in which I suggested that Judge Peck, who was quite an evangelist on the Speaking Circuit for Technology Assisted Review that maybe he shouldn’t decide a case that effectively was going to embrace it. I thought perhaps he should recuse himself. Well, some years later, I was with him at a conference and he was very kind, he has forgiven me and all as well and he agreed to pose with our company mascot, which was wonderful, and basically, he wrote another opinion which I really liked in which he said that it should be up to the parties to determine what to choose. He was not going to compel a party to decide to do TAR rather than search words. He figured the party was in the best position to decide and that certainly seems to me a very sound decision. We do still see in many small cases, it just doesn’t make sense to go to TAR, which is, it’s come down in price but it’s still bloody expensive and it’s complex to ramp up to do it in the first place. A lot of cases it just isn’t worth it, doing the good search terms and doing it well with an expert could be quite sufficient; don’t you think, John? John W. Simek: Yeah, I believe that, but don’t agree blindly towards search terms, make sure that you get to some realistic agreement between both parties. But if you’re dealing with emails certainly, don’t include the domain name of the parties as a search term because you might as well — you’re not going to filter anything, you got to get everything that way. So, it’s just be smart about terms. Sharon D. Nelson: Should we quickly mention the Fannie Mae case? John W. Simek: Go ahead. Sharon D. Nelson: That is such a great lesson for lawyers. This hapless lawyer went to court without his expert and he agreed to a stipulation whereby the other side got to determine all the search terms, and they came up with a lot of them, and so they ended up spending a fortune; in fact, they spent 9% of his agency’s budget on this discovery. So, it was way out of proportion, and that’s just foolish. I mean, if you’re going to negotiate without knowledge that doesn’t make any sense and it could end up being a nightmare and it certainly was here. So, competence first or if you can’t be competent, don’t do it, get an expert or learn it yourself before you proceed down such a dangerous path. And I think we have to call it a wrap there, John. John W. Simek: I think you are right. That does it for this edition of Digital Detectives, and remember, you can subscribe to all of the editions of this podcast at HYPERLINK “http://www.legaltalknetwork.com/”legaltalknetwork.com or on Apple Podcasts. And if you enjoyed our podcast, please rate us on Apple Podcasts. Sharon D. Nelson: And you can find out more about Sensei’s digital forensics, technology and cybersecurity services at HYPERLINK “http://www.senseient.com” senseient.com. We will see you next time on Digital Detectives.